AVCon is coming up, and we've got a selection of 5 new games to display (along with some old favourites available on request). We're excited to present games from both Global Game Jam, and last year's hugely successful Adelaide Game Jam. Stay tuned: Adelaide Game Jam 2015 will be coming to you soon after AVCon, with an official announcement of our dates very shortly. Patrick with "Alien Evolution", a great little game about what to do when you come to conquer a planet but here's nothing there to conquer. Andrada, Ben, Henry, Kathy and Phil with "Two Keys", a multiplayer game with awesome voice acting and far too many zombies for your computer to handle. Andrew with "UpDownLeftRight", a game about rescuing astronauts and flying into asteroids, written entirely left handed. Thankyou to everyone who came along, it was an awesome weekend because you helped to make it that way! You can play ALL the games from our site on the Global Game Jam website, and we'll be hosting slightly-more-complete versions of most games on our website in the next couple of weeks. Need another big jam fix? 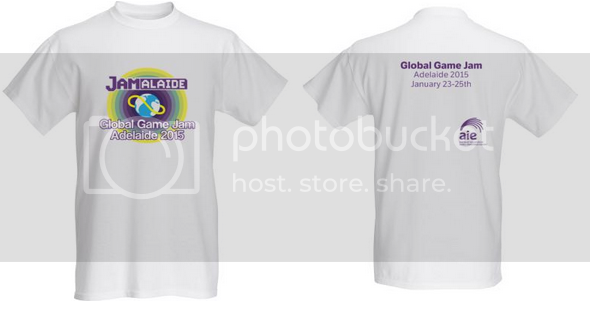 If you're hungry for more after Adelaide Game Jam 3, Global Game Jam 2015 is the place to be. We'll be in the same room (plus spreading to an extra room too) to host all of your smiling faces, and we'll be open the whole time (that's 3:30pm Friday the 23rd to 8pm Sunday the 25th of January). Places are limited by space, so make sure to book your tickets soon. For more details, see the jam page. It's Adelaide Game Jam Time! This year's theme is REACTION, for anyone watching from elsewhere. And if you're elsewhere... maybe you want to be here? All the details are on the Jam Page if you want to join us. Since there's so many people here, I'd recommend the Games Showcase on Sunday Night... it's set to be a big one! !